With all of their concerts behind them the boys of the Georgia Boy Choir were in good spirits when they awoke on Sunday morning to go visit a local school in Kunming. Upon arrival, they were greeted by a welcoming committee of teachers and students specially dressed for the occasion. After a short tour of the large facility, they were able to witness the schoolchildren performing their daily exercises. This was a spectacle which left the Americans slack-jawed. While music (the Toreador song from CARMEN) blared from speakers mounted all around the building, children began filing out in rows – row after row after row – 3000 of them. It looked like a military parade, only with children in matching warm-up suits. As they arrived in their places on the field, they began doing synchronized dancing exercises. 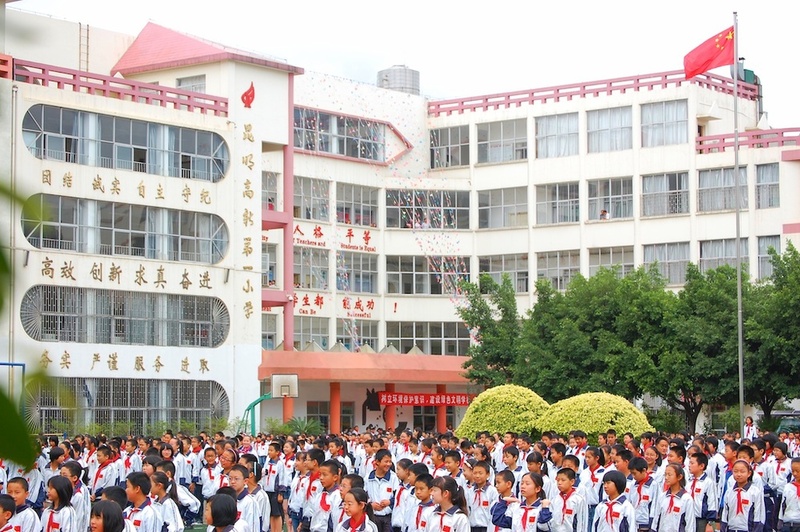 When they were all assembled, the Physical Education teacher spoke orders through a microphone, and the students shouted their deafening response in unison. The discipline and coordination were astounding. The Choir entourage thought this display was performed simply for them, but then learned this was a daily practice. When the assembly was over, the members of the choir were escorted in five different groups to attend an English class. Here, the Chinese students demonstrated their understanding of the language by introducing themselves in English and telling the group about themselves and their lives, and presented their American counterparts with gifts. After lunch in the school cafeteria, it was recess time. Here, the barriers of language and culture were erased as the children from different worlds joined together playing soccer and basketball and ping pong. Those members of the Choir and the chaperones who were not playing the games were surrounded by throngs of Chinese students asking for autographs. After a short rest, there was a final assembly where the school children displayed their talents in music and dance, and the Georgia Boy Choir in turn sang several songs. They even taught the Chinese children an American song, “This Little Light of Mine.” When the time finally came for the bus full of American boys to drive away, the Chinese children lined the driveway cheering and waving. When one travels all the way to China, it would be a shame not to visit its most magnificent city, Shanghai. So, although the Choir did not have a performance scheduled there, they flew in for just one day on Monday. It is difficult to see all of any city in just one afternoon, especially one the size of Shanghai, but the Georgia Boy Choir boys managed to see several of its most charming spots. An evening stroll along the riverside proved a wonderful way to spend the Choir’s final evening in China. The magnificence of the light displays on the buildings and skyscrapers, combined with the romance of the lighted riverboats slowly making their way up and down the river was truly astonishing. The boys had a grand time taking it all in. While they have all had a fabulous time during this 17-day odyssey, the Choir members are all eager to get back home to their families and friends. They miss American food and they miss their own beds, but when they return, they will have left a portion of themselves in China. The people they encountered along the way will never forget them. They have grown in ways that are difficult to measure. Their horizons have been expanded. They have empathy for a different culture and the millions of people it represents. They have grown more self sufficient, realizing that there are very few limitations to where they can go in their lives if they apply themselves; and they have grown closer to one another, having forged friendships which will last a life time. If you have read all of these reports, or even some of them, it is our hope that you have felt as though you were able to experience vicariously some of the thrilling experiences the Choir enjoyed. Many of you have helped make them possible through your financial contributions. If you have not done so recently, won’t you consider making a tax-deductible contribution to the Georgia Boy Choir today, so that the organization can continue to spread Beauty to our community, our city, our state and nation, and to the world? We hope that you will be able to come to a concert and see and hear the Georgia Boy Choir for yourself. If time and distance make that impossible, then we hope you will visit our website often, and that you will look forward as we are to next year’s tour to England. The Georgia Boy Choir China Tour Team. This message was written as the Choir made its way home to Atlanta from China. After it was written, there was a slight change in plans. Please see the following Press Release to learn what further adventures awaited the Choir when they reached American soil. Thunderstorms that rolled through the metro Atlanta area Tuesday afternoon and made a mess of rush hour, causing numerous wrecks and downed power lines and trees, also postponed the Georgia Boy Choir’s return home from their hugely successful 17 day tour of China. The choir comprised of 29 boys ages 9 – 18 from the Metro Atlanta area that has given concerts to sold out and standing room only crowds in Beijing, Kunnming, and Chendu, had to rely on the leadership skills, self-discipline, and character traits that they learn as members of the choir to endure the more than 40 hours of travel that will eventually bring them home. Divided into two groups, one in Dallas and one in Chicago, the boys learned Tuesday evening that their long awaited and much anticipated reunion with their families scheduled for Tuesday night, would be postponed another day. With increased travel costs causing them to have to divide into as many as three groups to get to China and back, they are now scheduled to arrive as one group at Hartsfield-Jackson International Airport via American Airlines Flight 2400 on Wednesday morning at 9:40 am greeted by anxious and enthusiastic family members and supporters. The choir gave numerous concerts while in China for massive crowds and also had the opportunity to appear on a live broadcast of a Chinese game show, while Artistic Director and Conductor, David White gave a Master Class for Chinese conductors. Along the way, they made stops at the Great Wall of China, the Forbidden City, the Beijing Childrenís Palace, and to see the ancient “Terra Cotta Army” that has been guarding the tomb of the First Emperor for thousands of years. The choir also broadcasted their concerts live over the internet for the benefit of parents, supporters, and music enthusiasts. Go to www.georgiaboychoir.org/tourbroadcasts to see video footage of those performances. While a harrowing experience to say the least, this isn’t the end of the road for these experienced ambassadors and world travelers. The choir is rapidly preparing for it’s 2010 – 2011 season and announced last week that in July of 2011 they will serve as the choir-in-residence at the Christ Church Cathedral School in Oxford, England; the setting for Lewis Carroll’s Alice’s Adventures in Wonderland and the Harry Potter movies. The choir has also produced several videos of their experiences touring China. Click here to view them and visit our website to read travelogues chronicling their tour to China.